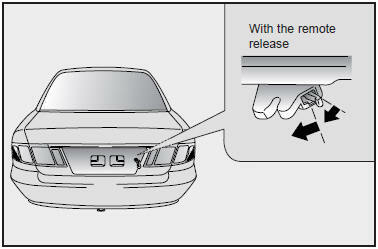 If the trunk lid lock knob (located near the latch) is in the “LOCK” position when the trunk lid is closed, it will not be possible to open the trunk lid by using the remote release. In this instance, use the master key to unlock and open the trunk lid. To allow the trunk lid to be opened with the remote release, push the trunk lid lock knob down, then to the opposite direction of the “LOCK” position.